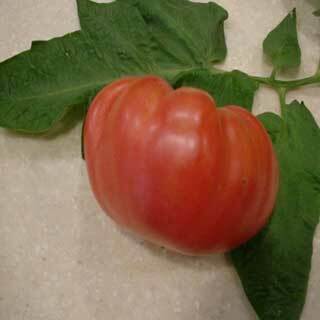 Healthy, heat tolerant, potato leaf vines generously yield large, pink, slightly flattened, super tasty beefsteak tomatoes. Healthy, heat tolerant, potato leaf vines generously yield large, pink, slightly flattened, super tasty beefsteak tomatoes. After crossing Brandywine x Neves Azorean Red, I sent F2 seeds to Dan McMurray who returned to me 12 different lines of F3 segregations. Dan pinpointed #10 as the most tasty of the bunch, and subsequently I have found #10 to be the smoothest shape, fairly crack free under normal conditions, and producing superior, compact indeterminate, large leafed, heavy foliaged vines. A real winner! 20 seeds per pack. Excellent pink variety amongst my 2013 grow-outs in regards to flavor. A flavor stand-out for sure. Production however was moderate for me in my zone 7 area in comparison to some other pink varieties grown under the same conditions. Will grow again next season to see if it yields better. Taste alone warrants this.